I'm actually planning to do that with one friend. Unfortunately most of them are online friends who live around the world. pandaphil wrote: The OP's heart is in the right place though. It would be nice to have a site where you could get a direct download. I've had trouble getting friends to try it simply because they don't do Torrents. 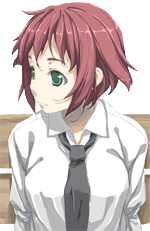 There are direct download links on the Katawa Shoujo homepage. It's below torrent, labeled "DDL". Yeah, I didn't realize that til over the weekend. I are stoopid.